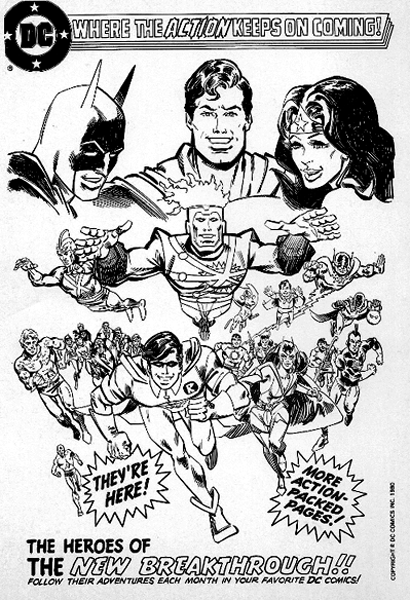 This is the back cover to the 1980 San Diego Comic Con program book, drawn by the legendary Joe Staton, featuring the stars of the DCU--including, thankfully, Aquaman! This ad is clearly focused on DC's new wave of back-up feature stars: the Sea King, Firestorm, the Huntress, OMAC, Air Wave, Adam Strange, etc. Some wouldn't last all that long, but it's cool seeing DC give them such a nice presentation here. Joe Staton has always been one of my favorite artists, and he never got to do Aquaman much, so a discovery like this (thanks to F.O.A.M.er Ilke Hincer) is always a treat! Also, with Firestorm being so prominent, this makes for a good Fire and Water Podcast-themed crossover!